Blog from Kompong Cham, Cambodia | Where is the Love? We left Siem Reap and headed further south west to Kompong Cham. The town was very different to Siem Reap in that tourism just hadn't arrived yet.Our first port of call was with a local family who were putting on a traditional lunch for our group.The house, as standard in Cambodia was on large wooden stilts, consisted of primarily one large room at the front and a small one, presumably the kitchen and perhaps one separate bathroom at the back.Occupying the house was one family, from what I could tell spanned 3 generations. 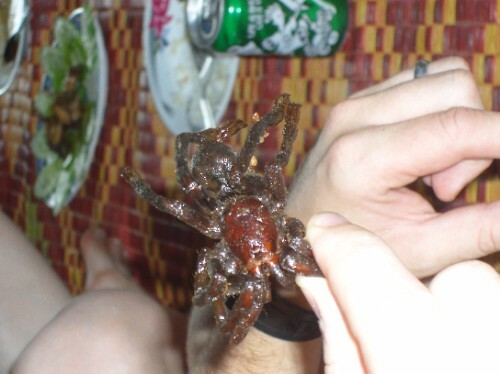 We all removed our shoes and sat at the traditional mats before the food was brought out.The dinner consisted of boiled rice, Khmer Curry, deep fried pork, fried frogs and noodle and green beans.It was exceptionally good.For dessert however what emerged from the kitchen was a bit of a surprise.A plate of fried tarantulas! All the boys tried them after Haing informed us we should eat it on one bite.Legs were crunchy, body chewy and probably will never eat another one.After finally getting through it I was horrified to see the family bring out their pet tarantula.I stayed well clear in case it got a whiff of my breath, although apparently it's fangs had been removed. The afternoon was spent touring Koh Paen island in the middle of the huge Mekong river on our ancient bicycles.As it was wet season the bamboo bridge was not in operation so we got the ferry or raft, along with 60 mopeds, across. The island was full of farming villages and paddy fields.We stopped at a family house for some of their grapefruit.They were so friendly especially the kids who went berserk when you took their photo and showed them the result on the screen.With limited exposure to tourists there was no trying to sell you anything or ask you for $1; very different from the Angkor temples.We then stopped off at a local school and helped with the English lessons.We had a class of 16 year olds and split into small groups for conversations.It was great fun but they had trouble with my accent. After a sunset ferry back and precarious cycle home in the dark we settled for and early night and a bus to our home stay early the next morning. Tewodros My concern with Chrome and IE8 is that they're still both Beta's. It's eougnh fun trying to design new websites which will function and especially maintain their appearance in the released versions of IE and Firefox. Now we have Chrome to deal with also in Beta, and when all the user-designed plugins start showing up, it's going to complicate matters further.Once both are in full release and the market share starts to become apparent, I'll pay attention to the top two. It will be interesting to see who those turn out to be.And like someone else noted, I'm not real comfortable with Google's rising importance. I read an article a few weeks ago where someone had all his apps, blog, and mail on Google and one day they vanished. Google didn't even respond to him. Google is also too quick to release even Beta products without really vetting them. I just don't trust them and yes I use gmail and blogspot. For now.